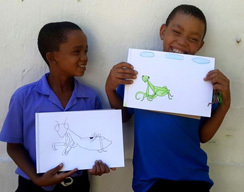 Supportive expert coaching for individuals with special needs in Lavender Hill, so they can experience the rich landscape of sensory experiences the ocean has to offer. 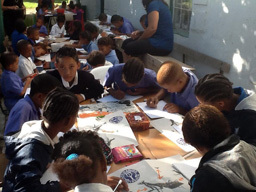 Immersive and intensive experiences in nature and of art, for groups of teens from diverse communities and schools in the Cape south peninsula. Healing vulnerable women through equine assisted therapy to build resilience and responsibility. Teaching cooking and gardening skills to unemployed adults to provide healthy sustenance for children afterschool. Gifting performances of Grade 12 drama set works in Lady Frere to uplift education standards in the Eastern Cape. 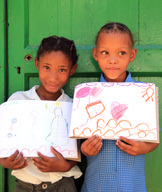 Addressing the lack of art activities for children age 6-12 years old in Khayelitsha, whilst tackling social issues including health and hygiene. Maintenance and upkeep of a pump track in Ocean View as a community resource for all. Emotional wellness and stress management tools for our event security team who face ongoing aggression and danger during the course of their working day. Renovating Alex Park in Pietermaritzburg in order that local youth have a safe and free space to skate. Each project has been awarded R5000 to effect their project. Reliance found its way to the Cape peninsula and Limpopo. At Ocean View Cycle Worx a bicycle workshop was upgraded and a resource centre – serving 40-50 youth on a daily basis – was built and painted. At the Mariba Bokamoso Crèche Food Garden in Segwashi, raised beds were prepared and planted, a nursery for seedlings was built and one staff member completed a 5-day course in permaculture – meaning that 35 children and 5 staff will be able to eat fresh produce directly from the own garden. Martha Kobela is pictured here with her certificate of achievement. Expression hung out on the south peninsula – popping up at the Muizenberg Festival with Project Ripple’s seemingly spontaneous street performances of dance, drama and music involving 60 children from Vrygrond and Muizenberg and approximately 100 adults, their highlight was the painting of a mural in Vrygrond, based on the festival theme “Celebrating Water”. 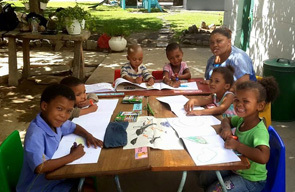 Masi Creative Hub used art therapy techniques to help young people, at local creches and clubs in Masiphumelele, create safe spaces to share and explore community issues, solutions and leadership goals. 80 young people from 4-21 were involved in this process. 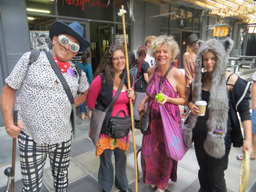 Keeping it Radical, Border Walks sparked Inclusion in the spaces between communities, when diverse bunches of folks immersed themselves in the “no man’s lands” of the south peninsula, exploring through the eyes of a local guide, with a specific connection to each site. Over 100 people experienced being, playing and learning together. Participation helped four vulnerable teenage girls, homed in Goodwood, build soft skills through working with horses. A series of eight equine assisted therapy sessions enabled the girls to gain ground with the self-confidence to try new things. 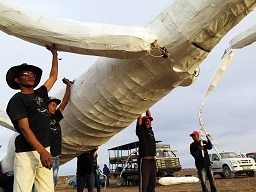 Immediacy sprung up Tsomo, in rural Eastern Cape with a drama festival combining performances and workshops which reached 1150 school age learners. 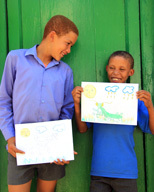 Eastern Cape School Arts Project also help to close the generation gap between parents and children by creating opportunities to do new things together, outside of their homes. The Bergie Bag Project has been walking the talk in the default, Gifting to those who are fighting for survival on a daily basis. With call outs to our community and two massive shops for supplies, BBP amassed 50 bags worth of “gift-and-run” surprises, and is set to become an ongoing endeavor. #CleanOurKasi in Mfuleni hosted an environmental pollution awareness session for 60 children and adults to spark a conversation about littering, recycling, planting trees and collective responsibility. With Each One Teach(ing) One to keep their neighbourhood clean and healthy. Leaving No Trace, the Urban Resilience Initiative in Muizenberg who occupy the under-utilized public spaces and community allotment gardens in and around the village, used their Spark Grant towards a collection scheme of organic and recyclable waste and permaculture workshops with funds spend on tools and equipment. We patiently await the report back of the Sunday Kos Market’s on Communal Effort, which is outstanding due to the project lead’s relocation. Spark Grants, launched in 2017, are microgrants of up to R5000 for community based projects. A new round of funding is available in 2018, applications open on 1 June. 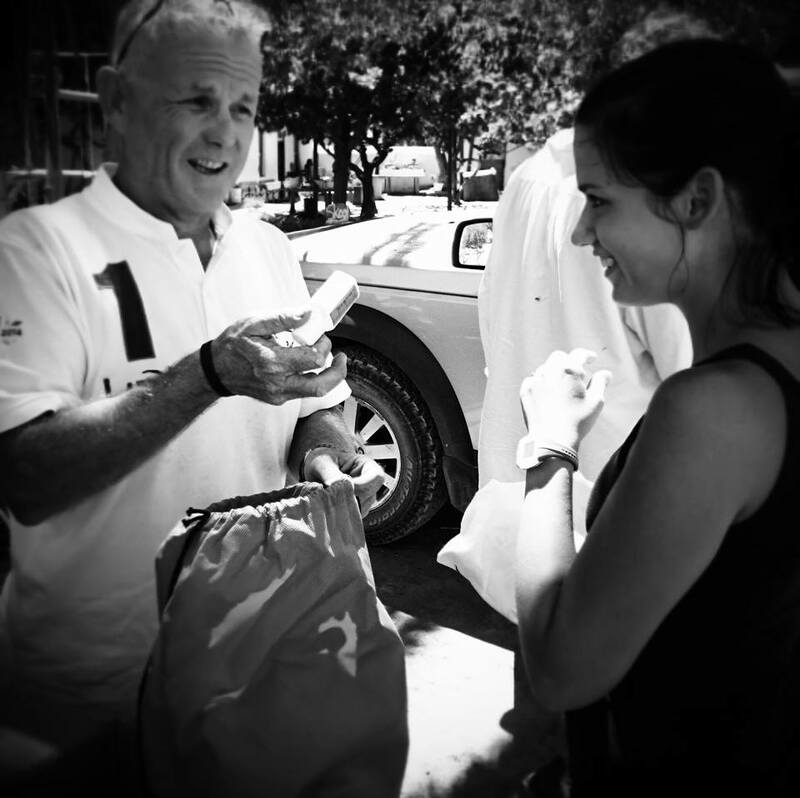 Bags of food, clothes and medical supplies to homeless people in Cape Town. Aims to call people in a loving, fun and effective way to stop littering in open spaces and most importantly where they live, to create more consciousness around plastic waste, separation of waste, recycling and the consequences of littering not only on planet earth but the environments we live in – starting in eMfuleni. The project in three phases will include tour in schools, workshops and school drama festival to introduce performing arts in rural areas of the Eastern Cape – Cofivamba and Tsomo. Equine Assisted Therapy – an innovative approach to professional counseling and skills development which uses horses to help participants address and resolve relational, behavioural, psychological and emotional issues- working with children from Home from Home, Cape Town. 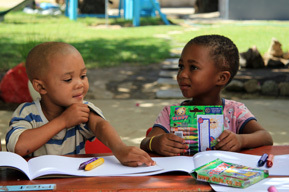 A safe space that is created for children and youth of our community (Masiphumelele) in order for them to be encouraged through transformation and learning through art therapy. 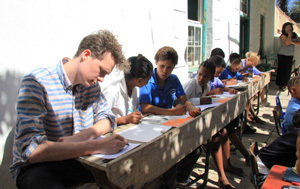 The project has results of good behavior and improvement in school work. 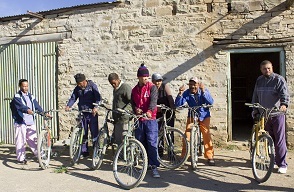 Repairs and sales of bicycles at reasonable cost, offering fun rides and bicycle mechanical training following the completion of a workshop and resource centre. Empowering our poverty stricken but capable society with a skill and contributing to green initiatives. Fusing foraging, cooking, storytelling & poetry, with participants from our diverse communities, to create encounters between the segregated communities of the Cape Deep South. A series of informal, outdoor and spontaneous performances that take place in Muizenberg and Vrygrond during the Muizenberg Festival. Project Ripple aims to animate, populate, unite and activate our community’s public spaces with creative expression. Aims to teach two students and two teachers about growing their own organic food, through the building of a nursery and hands on training. 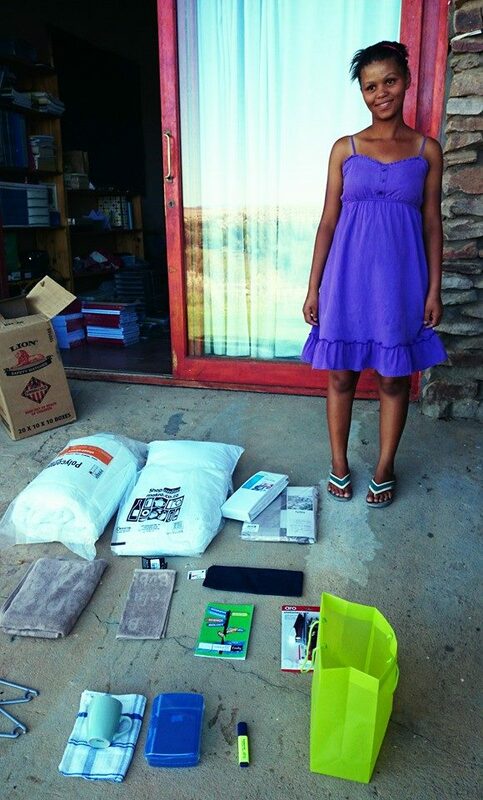 The final goal is to reduce the amount of food the parents and school has to fund at Segwashi Pre -Primary in Limpopo. A youth-driven initiative that incorporates the resource-sharing values of a co-operative. Every first Sunday of the month, starting from August, the market will be held in the Mbekweni (Paarl) area. 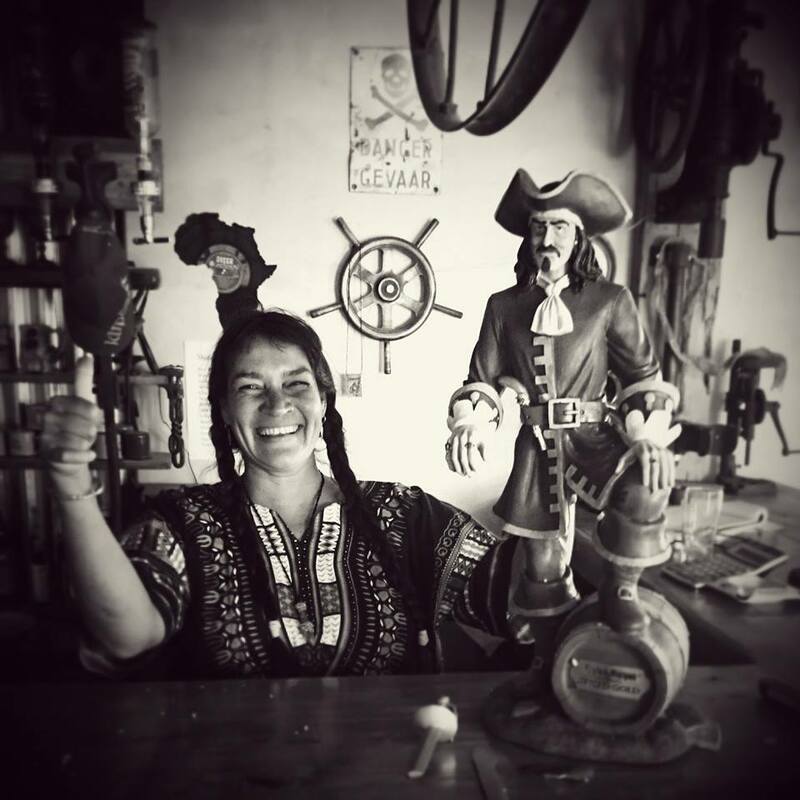 A micro-enterprise for two local people to collect and resell recyclable materials, to upcycle reusable unwanted items and to feed current community veggie boxes with compost in Muizenberg, Vrygrond, Capricorn, Lakeside. Outreach looks forward to following these 11 Sparks in the second half of 2017 and will post progress – so watch this space. 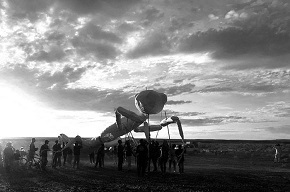 AfrikaBurn Outreach or “that other thing we do in the desert” facilitated a community tour to the neighbouring farms and communities of Tankwa Town. 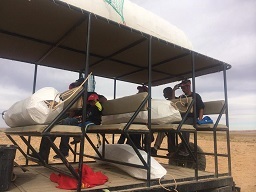 Partners Cart Horse Protection Association (CHPA) and Pedals for Peace visited Ompad; Scorpion’s Rock; Groot Kapel; Brakfontein and Elandslvei with the Outreach team, just two weeks after PLAY was done and dusted! The community day in Ompad saw six donkeys receiving wound care and general health care including injections for pain and infection, by inspector Diana Truter, who also conducted a general check up of four herd horses. Farrier Ashley Deelman fixed hooves and reset ill-fitting shoes, demonstrating trimming and rasping to the equines’ owners. 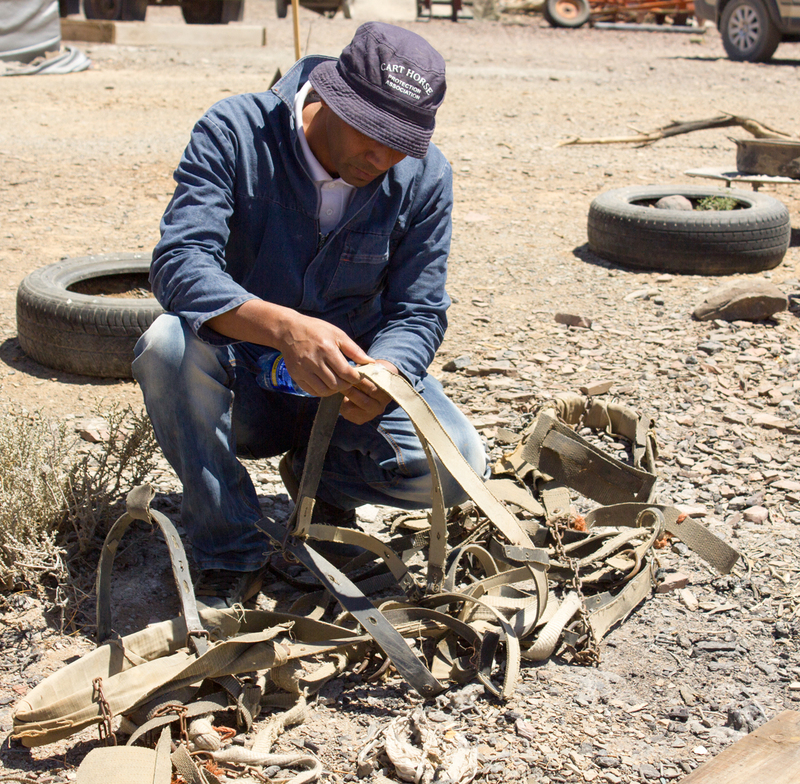 New harnessing, bridles and bits were distributed to three donkey owners, who were identified on the previous visit in November. Once repaired, the donkeys went for a test drive in all their finery. Meanwhile…Jimmy James of Pedals for Peace gave a demonstration of general bike repair and gifted 7 Qubeka bikes with helmets, pumps, spanner and tyre repair kits. Dog and cat food was also distributed. The day concluded with boerewors and roosterkoek; a job well done by all. 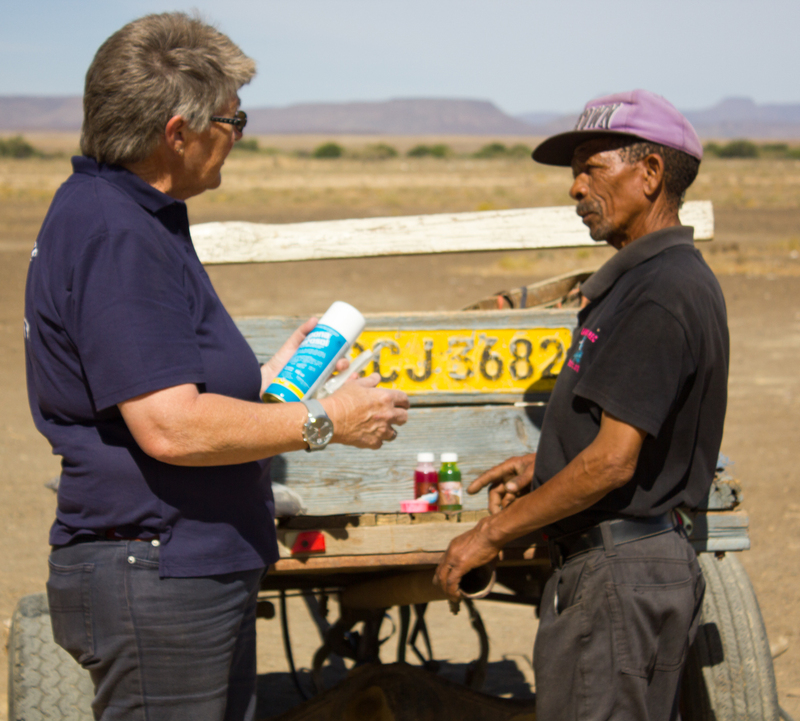 On day two, en route to Groot Kapel, home of the iconic Pink Caravan, the team stopped at Scorpion’s Rock to inspect the horses that weren’t received at the community day. Diana carried out wound care and treatment for tick infestations, whilst Ashley attended to hooves and inspected their tack. Dog and cat food was also dropped off along with puncture repair kits and spare tube. 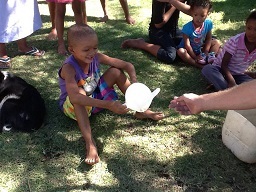 At Groot Kapel – the Krotz family were the other beneficiaries of the new harnesses. They had recently purchased a horse, so the harnesses needed to fit the biggest donkey and the new horse – which meant for some nifty adjustments by Ashley, who then took the cart for a spin. All four donkeys and the horse were checked over and some were treated for wounds. 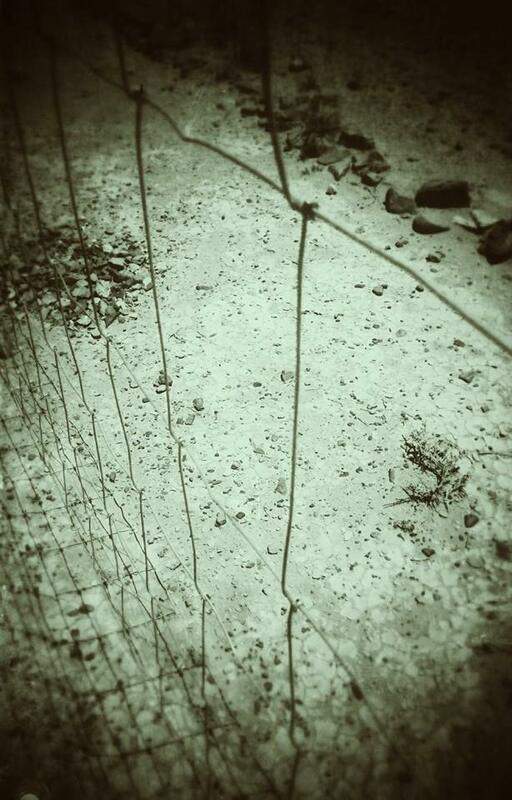 One donkey was lame – a badly bruised sole from the hard ground and rocks. Diana gave pain injections and advised Mr Krotz to keep the lame donkey off the cart. In addition there were five other donkeys roaming in the area that did not belong to the family. Jimmy James checked over the bikes and handed over some tyre repair kits and tubing whilst the cat and dogs scrapped over the donated food. The final destination of the day was Brakfontein, where there was a quick stop to look over donkeys and hand over some strapping for harnesses. In total, 31 equines were seen by CHPA over the two days. 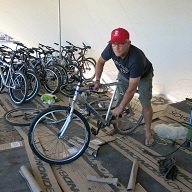 Seven Qubeka bikes were also dropped at Brakfontein with 15 helmets, pumps and spanners. Outreach sited the DMV mobile solar station to the Brakfontein koshuis, which will power the hostel for resident children when it opens in the next month or so. 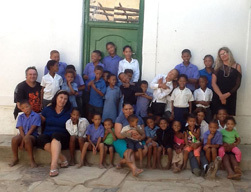 On the last day, Diana held a humane education lesson at Elandsvlei NGK School, teaching the children about caring for their pets and the five freedoms of animals. Megan hosted an art session – decorating horseshoes that would astound even the most gregarious of sparkle ponies. With the majority of its committee present, Outreach got down to business with school principal Nicolette van der Merwe about the current challenges the community is facing. Of particular concern is the future of the school, which like other rural primary schools, is facing threat of closure by government. Outreach is assisting with solutions and reassessing its financial support, with a focus on keeping those school doors open. Special thank you to Outreach’s hosts Diaan Nel; Francois and Nicolette van der Merwe who gifted accommodation for the team of eight for the duration of the tour and to OutCom members Sanet Kirstein and Conrad Lattimer who assisted with the hosting of project partners for the community tour. 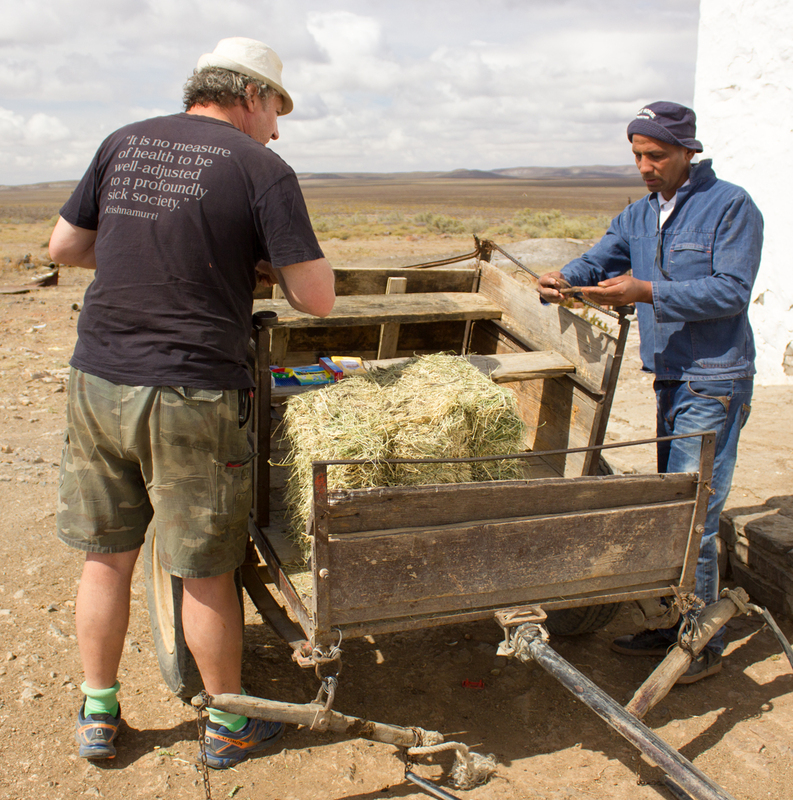 In 2016, the Outreach annual donkey derby took an entirely new path and became a donkey trek of note with Cart Horse Protection Association and Leti Kleyn pulling in for a recce through the farms on and around the R355 in the first week on November. 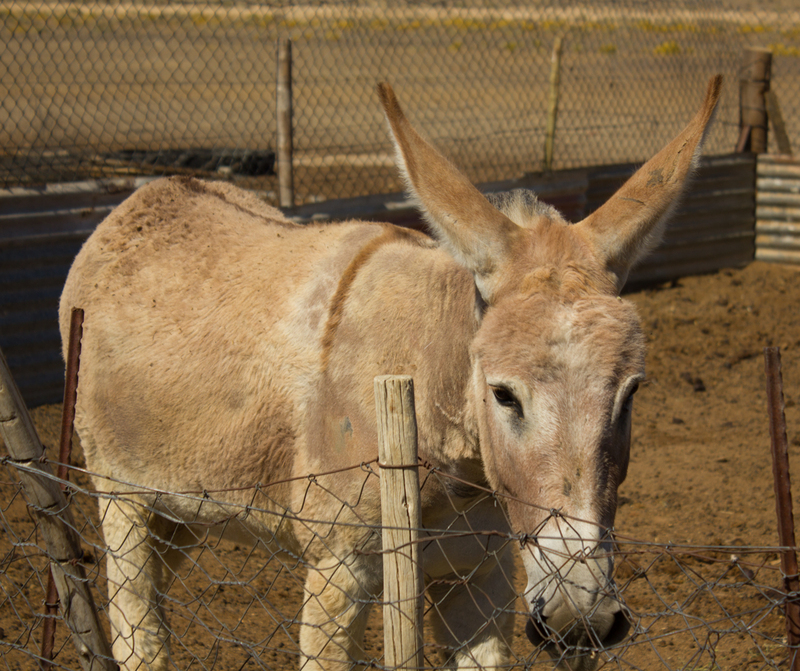 Finding Jack and Jenny at home proved to be quite a challenge as they were often out on the veld, but after some 1000 kms, CHPA’s Megan White, Diana Truter and Ashley Deelman had inspected 18 equines and recorded a total of 30 donkeys, 29 horses and seven mules. Equine welfare analysis comprised an assessment of animal’s behaviour, body condition, wounds, lameness and signs of injury and disease and it was found generally that where farmers supported owners, the animals were in better shape. 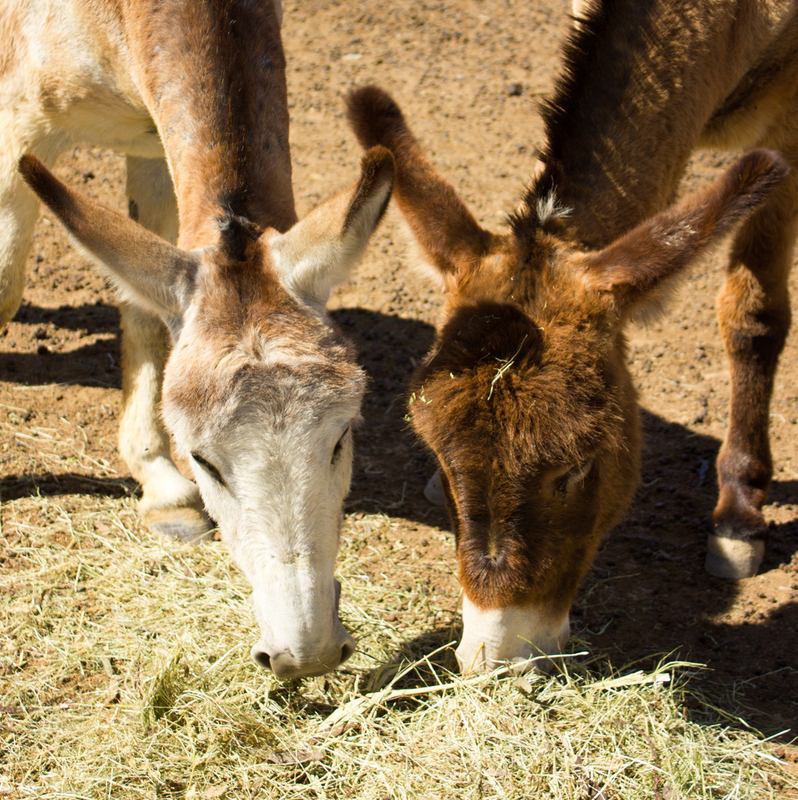 In the Tankwa, donkeys, horses and mules benefit greatly from getting their nutrients from indigenous plants and roaming on the veld in their natural order. 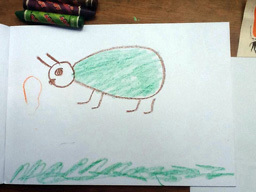 However, Megan noted: “The biggest welfare issue remains the harnessing. Almost all the harnesses we saw are beyond repair. Although we did not see many donkeys with wounds, this could be attributed to the fact that the donkeys do not work every day, which gives the wounds time to heal. All have scars from harnessing; the owners do not have the money or the means to rectify this. First aid kits and medicines were distributed and explained to owners and plans are afoot (or hoof) to spark some basic farrier training and harness making, with tools and materials in tow. In addition, dogs received food and Christmas boxes full of human goodies for local kids were distributed. 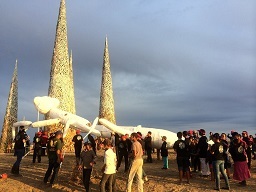 AfrikaBurn 2013 – it was a cold evening and the red wine along with a camp fire was helping keep the chill at bay – creativity abounded! This was our first burn and within minutes of arriving we were committed burners! We needed to work on how we as a family and a camp could add value to our new family in Tankwa, but more importantly how we help the by adding value and leaving a positive legacy with those that we would leave behind in the Tankwa… thus was born the idea of Pedals for Peace. Moving around Tankwa Town without wheels becomes challenging! Getting a bike to Tankwa Town even more so!! We took up the challenge of securing bikes, which burners could pre-purchase and we could deliver, to the burn to await collection. 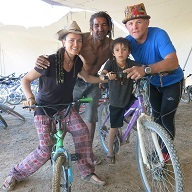 The bikes are then used by burners both local and international and in almost all cases gifted back to the camp for the most exciting part of the project! Gifting beyond the playa!! 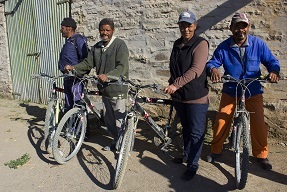 All bikes received back are allocated to projects that have been pre identified and consulted with. These are projects in the region of the Tankwa…. The Objective? 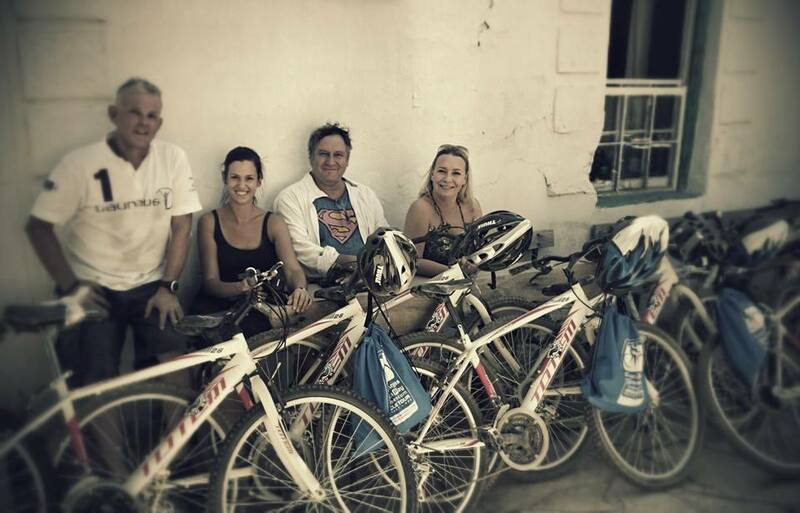 To leave a positive lasting legacy with those less fortunate from us who invade and enjoy their wonderful landscapeIn 2014 we trialled the idea and gifted 20 new bikes to Elandsvlei Primary school just 15kms away from Tankwa Town. Our eternal thanks go to all of you that supported the project and bought and gifted your bikes back for distribution. To those who gifted their own new bikes that allowed us to distribute more bikes than we originally planned a big thumbs up. A very very special word to the three young kids who gifted their brand new bikes for the younger kids at the Tankwa schools!! This project was made possible by the wonderful support of the following contributors to whom we extend our heartfelt thanks and gratitude – Mekor Mazda, Avalanche Bikes, Diamond Back Bikes, Nomadik Tents, Olympic Cycles. Today produced the most amazing and unexpected surprise in the form of an email from the Tankwa! Nicolette is the Headmistress of Elandsvlei School, one of the schools that helped us distribute the bikes to learners and farm staff. 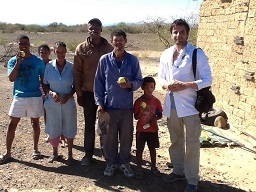 She and her husband Francois are inspirational folk doing the most amazing work in the area. Here is her mail and while you are reading it understand that YOU are the reason that we are all able to make the change in peoples lives that we do…. THANK YOU PEOPLE OF TANKWA TOWN! our drive back we passed a group of members of our community – about 20 of them – on bicycles. We stopped and asked where they are heading. They did a little race yesterday to another neighboring farm about 30km’s from us. 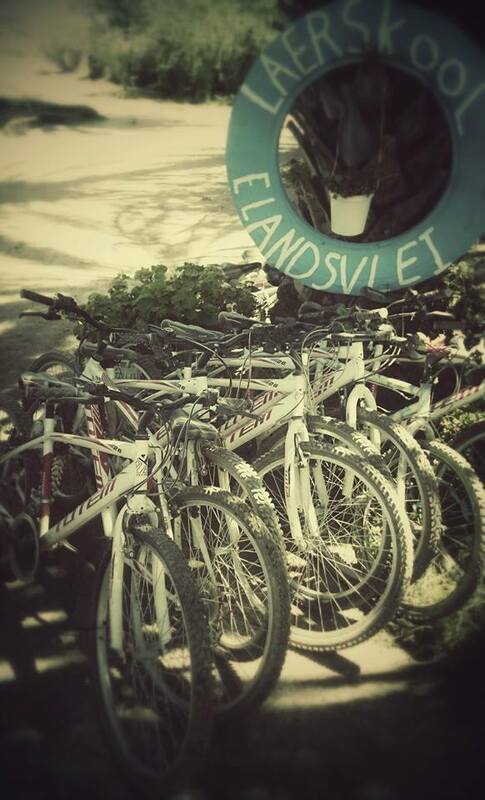 It was so pleasant to see the bikes are used to also keep them busy in a positive way, other than drinking on weekends. Unfortunately I did not have my camera with me. Me and Francois decided to organize a race for them on the farm in a few weeks from now. We are planning to participate as well. And give prize money or something for the winner. Thanks again for everything. 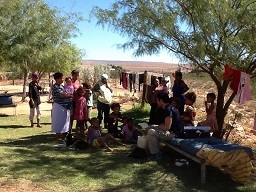 Outreach helped take a doctor up to the community of Brakfontein, Elandsvlei and Morgenster, where kids and adults were properly treated for infections and other ailments. 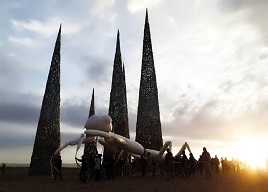 The Mantis project was a huge success at the 2015 Afrikaburn, bringing the Tankwa community to the Burn to setup and walk the Manits from Subterrafuge across the Binnekring to end up at the DMV. 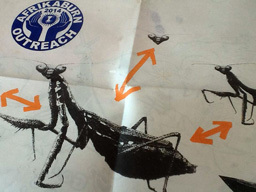 Many Burners were thrilled to enjoy the spectacle of a huge Mantis cozying up to Subterrafuge, kiss the Moon and show itself off to Tankwa Town. A great team of enthusiastic and skilled creative team jumped in and attended all the workshops and further work parties. Daya Heller taught the crew how to make tissue and cane sculptures. 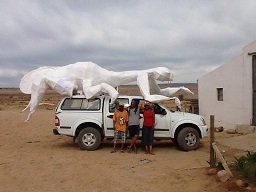 Uprize and Annie Le Roux were on hand in the Tankwa to help construct the Mantis with the Elandsvlei community. 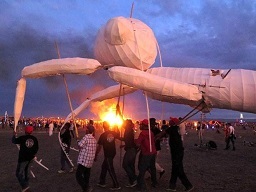 Kaospilot crew were on hand at the Burn to help construct and walk the Mantis…great thanks to all involved! 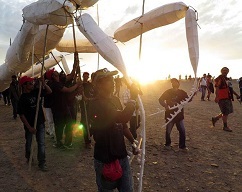 The Mantis is a significant creature amongst the communities of the tankwa and we managed to bring this across to the greater community of South Africa. 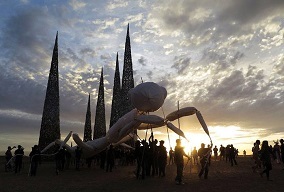 The mantis project will grow every year. We will adds wings and more lights. We will make her walk at our decompression party in June and we will get her to walk at the next art festival in Cape Town. 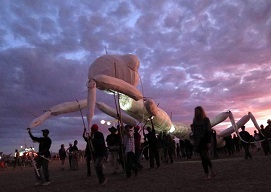 We’re very proud to announce that this year members of the Tankwa community will be participating in our event as artists, on The Mantis Project, which will consist of a performance piece with a massive praying mantis as the centrepiece. 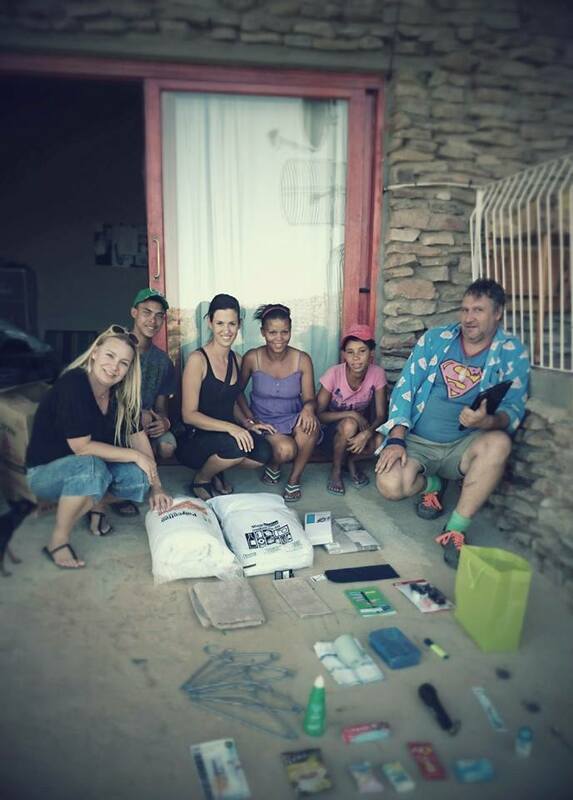 We took 3 of the KaosPilots project up to Elandsvlei to introduce them and to hold a workshop with Annie le Roux and our Outreach team. 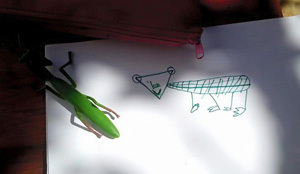 Stories about the Mantis were shared and beautiful drawings were made by all. 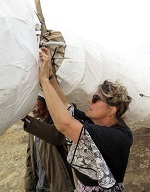 As part of the project, long time AfrikaBurn artist Daya Heller will give a workshop on cane and tissue sculpture techniques, which will be passed onto the Elandsvlei community in the next few weeks. 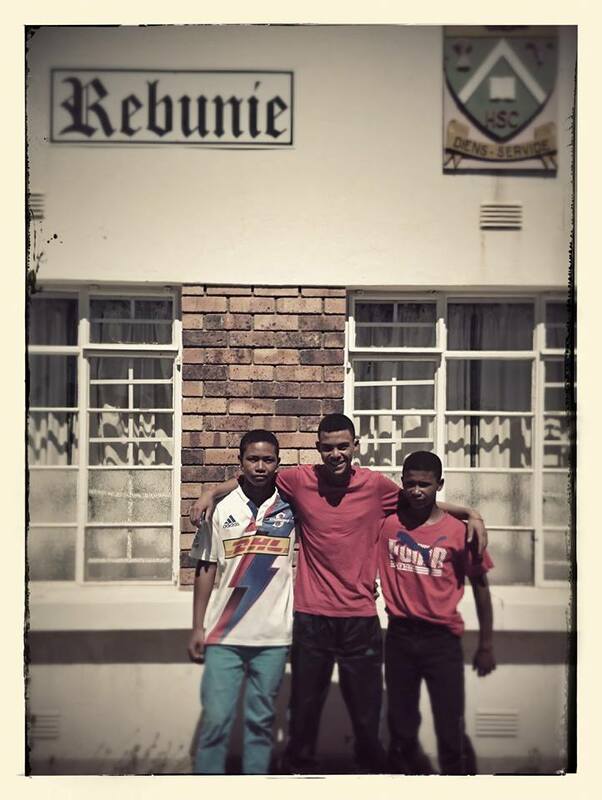 23 Feb 2015 – Ryno Botes the young man outreach has helped with at Calvinia high school has been selected for the Boland athletics team… He ran 0.02 faster then anybody else in the district. This is a big wow. 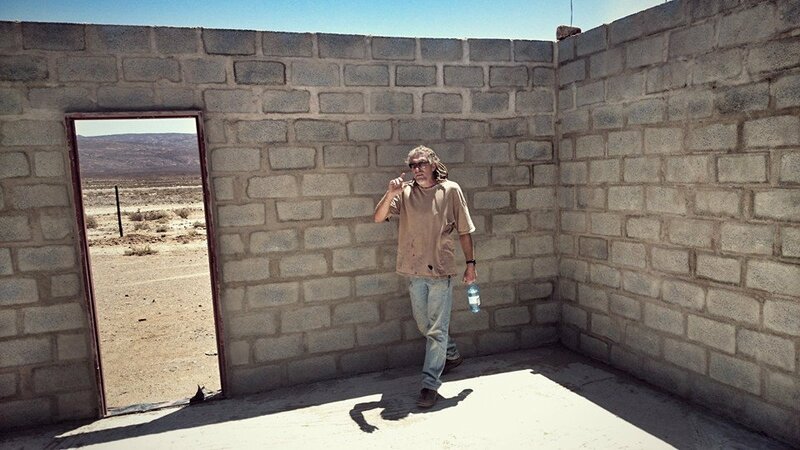 21 Feb 2015 – The new nearly open community centre on the R355 next to padstal. Plans and fencing paid for by outreach. Building paid by German funders. Library shelves wood from upsetters build by Hein Lange. 50 trees to be planted. 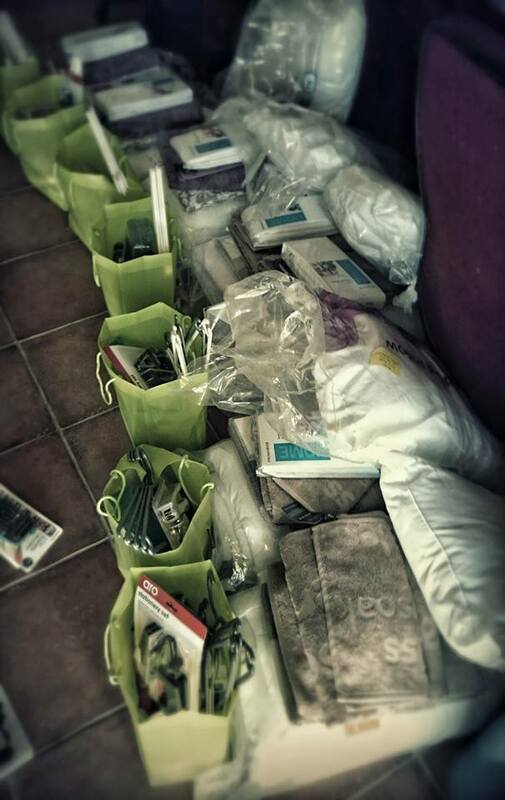 12 Feb 2015 – Outreach picking up 20 cases of Afrikaans books from naspers for 3 tankwa libraries. Thank you to everybody who made this possible. 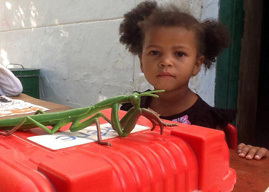 The Mantis Project is a outreach project on a more community interaction and sharing concept. We will be working with the greater Elandsvlei, Brakfontein and Morgen Ster community. We have been working on this for about 3 years and finally we have some traction on the ground. 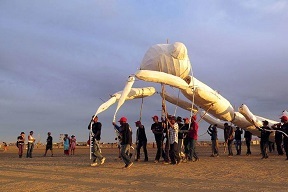 We want to build a bus size mantis…the students and builders will the walk the giant mantis around Tankwa town during the AfricaBurn week. It will be build from cane and tissue paper. 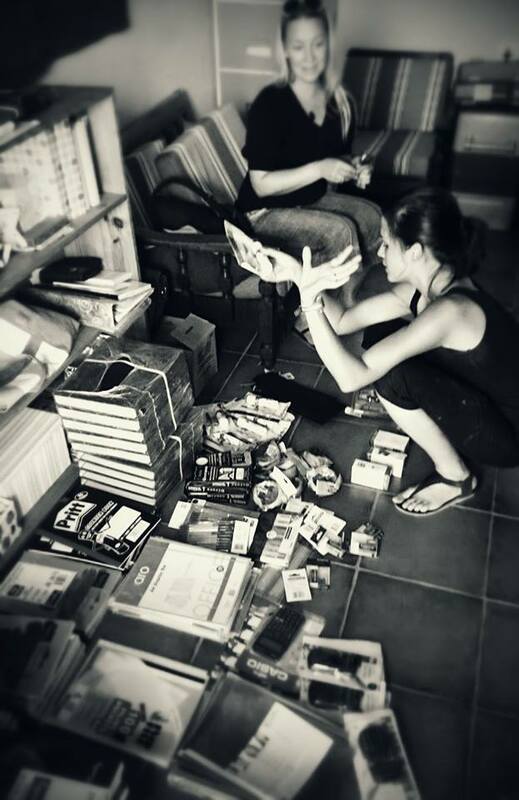 Mantis project is on full steam ahead mode….we will be working with the community of Elandsvlei and Cape Town creative crews, including Daya Heller and Annie Brand Le Roux. 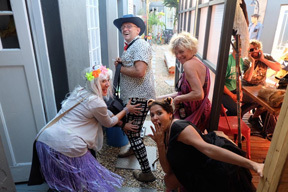 February 2015 – Join us for a fun-filled day playing urban golf in ‘fancy dress’ over an 18 hole course plotted through the beautiful and diverse streets of Woodstock, Salt River and Obz. 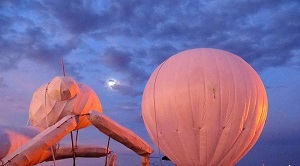 Amazing street art and graffiti is displayed throughout the course and each hole is a unique showcase for the area and the spirit of Afrikaburn. A number of holes are drinking holes to ensure players remain in high spirits! 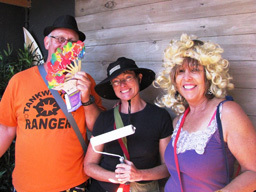 The event is in support of AfrikaBurn Outreach and NOAH (Neighbourhood Old Age Homes). A donation drop box will be available at registration and any unwanted items and non-perishable food items are gratefully received for the NOAH Bric-a Brac shop and old age homes you will pass on the route. 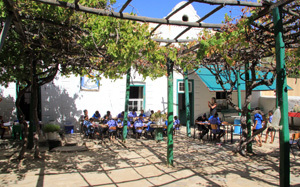 12 Feb 2015 – More good news is that Hein Eksteen from stonhenge farm has organized through contact in Naspers media 24 a catalog of Afrikaans books for Elandsvlei school and Padstal Tankwa community centre. This is a big score as afrikaans books are not always available. Outreach picking up 20 cases of Afrikaans books from Naspers for 3 Tankwa libraries. Thank you to everybody who made this possible. 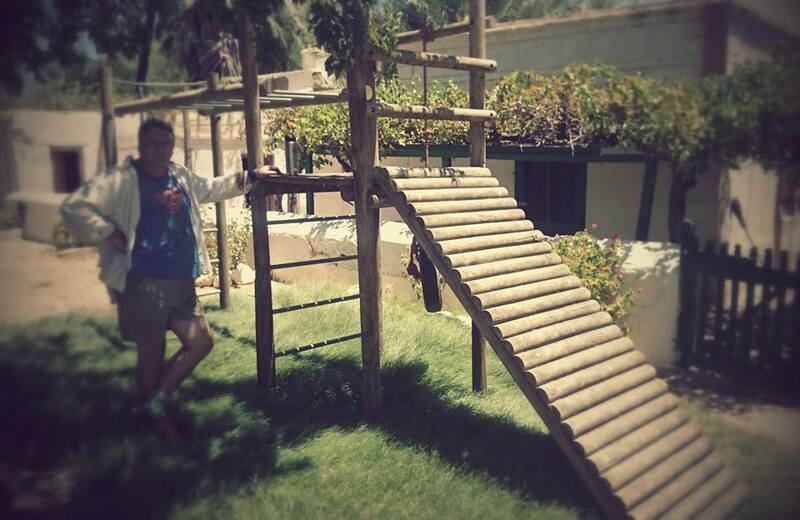 27 Jan 2015 – Boerasic park the AfrikaBurn theme camp wrangled by Jomandie Dempers has contributed a generous donation towards the 6 Elandsvlei learners boarding in Calvinia and attending Calvinia high school. Thanks to Lisa Veit for donating a large retro couche for the boys koshuise in Calvinia. Huge thanks to the following people for their kind help and donations, Pedal for Peace for donated bikes (David Bellair), Jomandie Dempers and the Boerasic Park theme camp for school supplies, Alex Wheeler for Captain Morgan and Deathrace car bonnet, Mandy, Mia and Daisy darling for Jungle Jim, Brendan Smithers and Upsetters for wood donations… and the huge support from the AfrikaBurn community (as always). 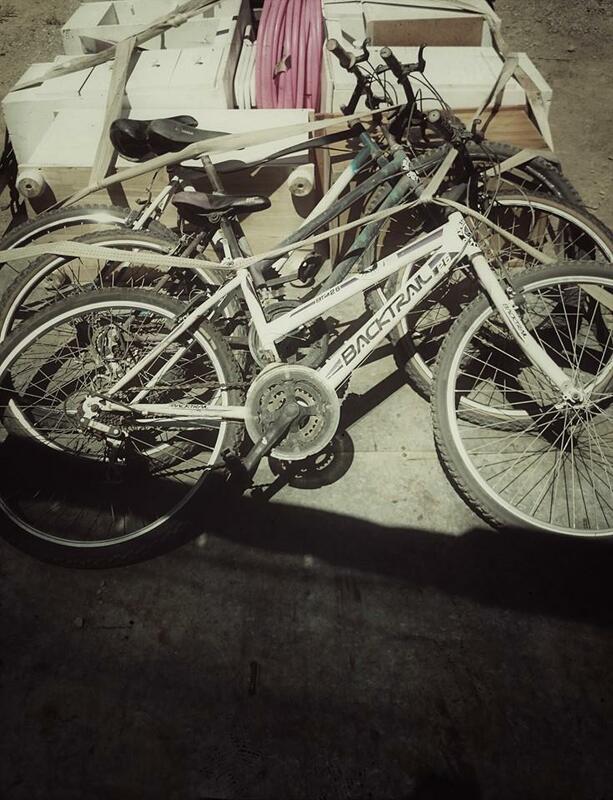 Global Wheeling has initiated and runs this project, Outreach helps to transport the unclaimed bikes to founder Kayden Kleinhans’ workshop and provides donations towards repairs. 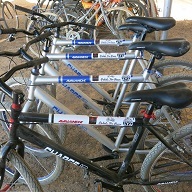 The object is to fix and redistribute broken bicycles from the AfrikaBurn event. 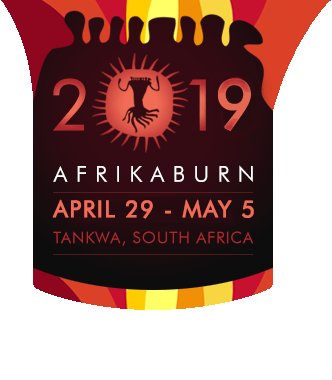 Marissa from Burning Mail (one of the oldest theme camps at AfrikaBurn) has offered her help utilising her resources and network, focusing on Tankwa schools and Observatory Primary School. 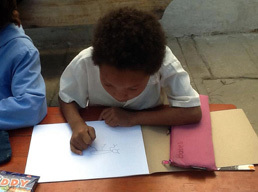 Ideas include a mail and correspondence between the pupils at the schools, teaching and stationary donations. Outreach runs a stand for donations at the ParkOff event where we then distribute the items of clothing and books to the Tankwa community. We have provided stationery and assistance in printing copies of the comic books. 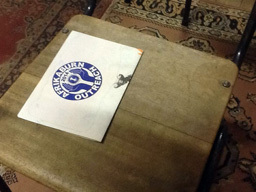 We also plan to offer in distribution of the comics at ParkOff and the Observatory Open Streets events. 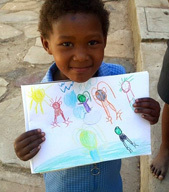 We have assisted Charles Palm with his community creative projects planned for Pniel in the Western Cape. 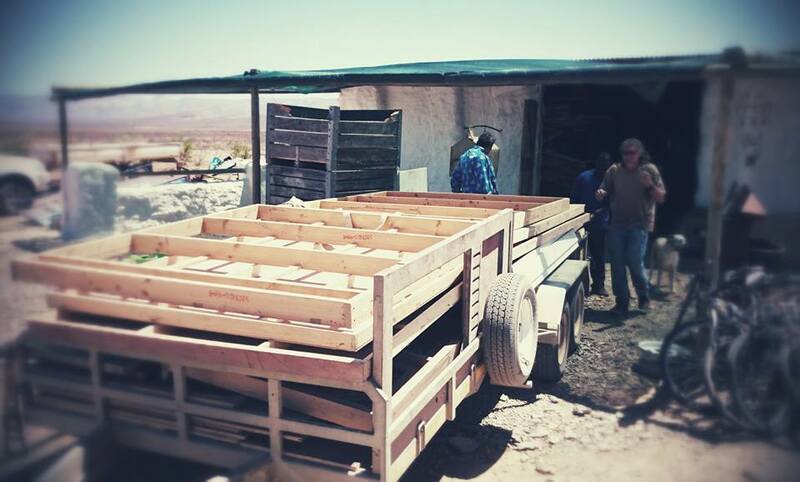 Outreach has organised a cooperative project for discounted supplies from Build It Tableview for AfrikaBurn projects and projects in the Tankwa community. 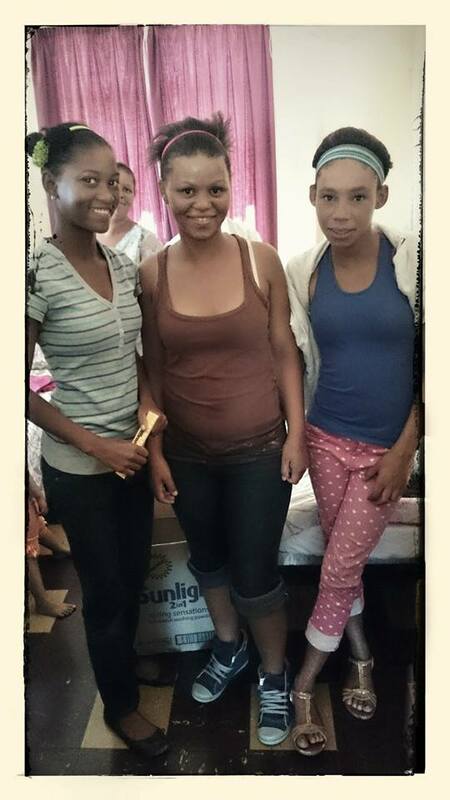 Outreach is supporting Mickey who runs a day-care and soup kitchen in Khayelitsha township, feeding over 150 people per day. Outreach has supported and donated to the Tankwa Walk last month where Jacqueline Jacobs and 70 people walked the R355 in raising funds for the Elandsvlei school and community. Wilhelm ‘Sherrif’ Du Plessis will walk with Jacqueline next year. This will become a self sustaining event. Donations were distributed to the people via a burner initiative being run in the area. Our community advisers are Hein Lange, Henk van Niekerk, Jonathan Hoffenberg, Grier Schoeman, Up Tize (Willifred Danhouse), Conrad Lattimer and Robert Weinek. Lauri-Anne Jaques Veitch (also known as Dickie) is our financial adviser and whizkid. Daniella Hooijemans, Sonica Kirsten, Sanet Kirstens, Adetola Okunlola, Helena Sheridan and Louw Sheridan are honorary volunteers.